The Japanese addressing system is used to identify a specific location in Japan. When written in Japanese characters, addresses start with the largest geographical entity and proceed to the most specific one. When written in Latin characters, addresses follow the convention used by most Western addresses and start with the smallest geographic entity (typically a house number) and proceed to the largest. The Japanese system is complex and idiosyncratic, the product of the natural growth of urban areas, as opposed to the systems used in cities that are laid out as grids and divided into quadrants or districts. A town block indicator plate (街区表示板, gaiku-hyōjiban) displaying the address Nakamura-ku, Meieki 4-chōme, 5-banchi (in Nagoya). Japanese addresses begin with the largest division of the country, the prefecture. Most of these are called ken (県), but there are also three other special prefecture designations: to (都) for Tokyo, dō (道) for Hokkaidō and fu (府) for the two urban prefectures of Osaka and Kyoto. Following the prefecture is the municipality. For a large municipality this is the city (shi, 市). Cities with a large enough population, called designated cities, can be further broken down into wards (ku, 区). (In the prefecture of Tokyo, the designation special ward or tokubetsu-ku, 特別区, is also used for municipalities within the former city of Tokyo.) For smaller municipalities, the address includes the district (gun, 郡) followed by the town (chō or machi, 町) or village (mura or son, 村). In Japan, a city is separate from districts, which contain towns and villages. However, exceptions abound, and the line between the schemes is often blurry as there are no clear delimiters for machi, aza, etc. There are also some municipalities like Ryūgasaki, Ibaraki which do not use any subdivisions. Below this level, two styles of addressing are possible. In the newer jūkyo hyōji (住居表示) style, enacted into law by the 1962 Act on Indication of Residential Address (住居表示に関する法律) and used by the majority of the country, the next level is the city block (街区 gaiku), always followed by the building number (番号 bangō). Building 10 in block 5 would be formally written as 5番10号 (5-ban 10-gō). For apartment buildings, the apartment number (部屋番号 heya bangō) may be appended to the building with a hyphen, so apartment 103 in the aforementioned building would be 5番10-103号. In the older chiban (地番) style, still used in some rural and older city areas, the next level is the land number (番地 banchi), optionally followed by a land number extension (formally 支号 shigō, more often 枝版 edaban). The land number designates a piece of land registered in the land registry, and a land number extension is assigned when a piece of land is divided into two or more pieces in the registry. This can be written as any of 3番地5 (3-banchi 5), 3番地の5 (3-banchi-no 5) or 3番5 (3-ban 5). Land not designated by the registry is known as mubanchi (無番地, lit. "no land numbers"), with any dwellings there being bangaichi (番外地, lit. "land outside numbers"). In both styles, since all address elements from chōme down are numeric, in casual use it is common to form them into a string separated by hyphens or the possessive suffix の (no), resulting in Asakusa 4-5-10 or Asakusa 4の5の10. This renders the two styles indistinguishable, but since each municipality adopts one style or the other, there is no risk of ambiguity. The apartment number may also be appended, resulting in 4-5-10-103. 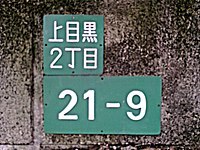 A sign displaying the town address Kamimeguro 2 chōme; block (gaiku) 21, building (bangō) 9 identifies the residential address. The upper plaque is the district name plate (町名板, chōmei ban) and the lower, the residential number plate (住居番号板, jūkyo bangō ban). Street names are seldom used in postal addresses (except in Kyoto and some Hokkaidō cities such as Sapporo), and most Japanese streets do not have names. Banchi blocks often have an irregular shape, as banchi numbers were assigned by order of registration in the older system, meaning that especially in older areas of the city they will not run in a linear order. It is for this reason that when giving directions to a location, most people will offer cross streets, visual landmarks and subway stations, such as "at Chūō-dori and Matsuya-dori across the street from Matsuya and Ginza station" for a store in Tokyo. In fact, many businesses have maps on their literature and business cards. In addition, signs attached to utility poles often specify the city district name and block number, and detailed block maps of the immediate area are sometimes posted near bus stops and train station exits. In addition to the address itself, all locations in Japan have a postal code. After the reform of 1998, this begins with a three-digit number, a hyphen, and a four-digit number, for example 123-4567. A postal mark, 〒, may precede the code to indicate that the number following is a postal code. Note while almost all elements of the address are reversed in roman, connected strings of numbers are treated as units and not reversed. Firstly, the "city block and building number" is a unit, and its digits are not reversed – in this example it is "5-3" in both Japanese and roman, though the Japanese (literally Yaesu 1-Chōme 5-3) is partly reversed to "5-3, Yaesu 1-Chōme" in roman if chōme is separate. Similarly, if the chōme is included, these also form a unit, so in this example the string is 1-5-3 in both Japanese and roman. As mentioned above, there are certain areas of Japan that use somewhat unusual address systems. Sometimes the differing system has been incorporated into the official system, as in Sapporo, while in Kyoto the system is completely different from, but used alongside of, the official system. Kyoto and Sapporo have addresses based on their streets being laid out in a grid plan, unlike most Japanese cities. Kyoto was laid out on a grid in 794 (Heian-kyō), and grid-based addresses are used. Although the official national addressing system is in use in Kyoto – in Chiban style, with ward (区, ku), district (丁目, chōme), and land number (番地, banchi), the chō divisions are very small, numerous, and there is often more than one chō with the same name within a single ward, making the system extremely confusing. As a result, most residents of Kyoto use an unofficial system based instead on street names, a form of vernacular geography. This system is, however, recognized by the post office and by government agencies. For added precision, the street-based address can be given, followed by the chō and land number. Sometimes multiple houses share a given land number, in which case the name (either just family name, or full name of resident) must also be specified; this name is generally displayed in front of the house on a hyōsatsu (表札, name plate), often decoratively presented, as house numbers are in other countries. The system works by naming the intersection of two streets and then indicating if the address is north (上ル, agaru, "above"), south (下ル, sagaru, "below"), east (東入ル, higashi-iru, "enter east"), or west (西入ル, nishi-iru, "enter west") of the intersection. More precisely, the two streets of the intersection are not treated symmetrically: one names the street that the address is on, then gives a nearby cross street, and then specifies the address relative to the cross street. What this means is that a building can have more than one address depending on which cross street intersection is chosen. This address means "south of the intersection of Karasuma and Shichijō streets" – more precisely, "on Karasuma, below (south of) Shichijō" (Karasuma runs north-south, while Shichijō is an east-west cross street). The street address may alternatively be given as 烏丸通七条下ル (with street (通, dōri) inserted), indicating clearly that the address is on Karasuma street. "(On) Karasuma (street), above (north of) Shiokōji (street)"
"Ōsakachō 384, (on) Karasuma street, below (south of) Gojō"
Sapporo’s system, though official, differs in structure from regular Japanese addresses. The city-center is divided into quadrants by two intersecting roads, Kita-Ichijo and Soseigawa Dori; blocks are then named based on their distance from this point, and farther from the city center, multiple blocks are included in each. The east-west distance is indicated by chōme (a slightly unorthodox usage of chōme), while the north-south distance is indicated by jō, which has been incorporated into the chō name. This address indicates that it is the fifth building on a block located 5 jō north and 2 chōme west of the center, named with the actual cardinal names of kita (north), minami (south), nishi (west), and higashi (east). The directional names for jō extend for about 7 kilometers to the north/south along the main Soseigawa Dori, but only about 3 kilometers at the most to the east and west; outside of that area, jō have other names, though the starting point of each is still the corner in the direction of the city center, often using landmarks such as the Hakodate Main Line or large roads to mark the new numbering. Building 1 on block 1 of a chōme measuring 6 jō south and 10 chōme east of where a small street meets the Toyohira River. The direction is understood based on the quadrant of the city the jō is considered to be in, which may be off from the actual direction to the city center, depending on the landmark used. Far-flung and less crowded parts of the city may instead use a standard chō name, rather than a numbered jō, such as Makomanai. The current addressing system was established after World War II as a slight modification of the scheme used since the Meiji era. For historical reasons, names quite frequently conflict. In Hokkaidō many place names are identical to names found in the rest of Japan; this is largely the result of past immigration into Hokkaidō of people from mainland Japan. Historians note that there is also a significant similarity between place names in Kansai region and those in northern Kyūshū. See Japanese place names for more. Named roads, or 通り (dōri), are roads or sections deemed noteworthy and given a name. Unlike in other nations, named roads are not used in addresses but merely for ceremonial purposes; excepting in the abovementioned Kyoto system. Two "chōmei-name plates (町名板)" are with Romaji for people unable to read the Japanese. Left plate is Ginza 4 chōme road cross at 5 chōme 7-2, next to "Ginza 4 chōme koban", where the opposite side of main street from Wakō. Right plate is Shimbashi 2 chōme, block name is "underground city of (Shimbashi station) east exit (東口地下街)" without banchi number. An older chōme address name plate in Kuwabara, a residential section of Matsuyama, Ehime; the address of this block in Japanese is 愛媛県松山市桑原４丁目3. ^ "住居表示に関する法律". Law.e-gov.go.jp. Retrieved 26 May 2017. ^ "How to Fill Out EMS label - Japan Post". Post.japanpost.jp. Retrieved 26 May 2017. ^ "Access (アクセス)". Kyoto-tower.co.jp (in Japanese). Archived from the original on 2016-08-09. Retrieved 2016-05-25. ^ "会社概要｜JRタワー 札幌駅から直結のショッピングセンター ＜アピア・エスタ・パセオ・札幌ステラプレイス＞". Jr-tower.com. Retrieved 2017-05-27. ^ "札幌立花病院｜-アクセス". Fukuwakai.or.jp. Retrieved 2017-05-27. ^ 札幌市豊平区役所. "区役所案内／札幌市豊平区". City.sapporo.jp. Retrieved 2017-05-27. ^ "会社概要 | 和倉温泉 加賀屋グループ | 企業サイト". Kagaya.co.jp. Retrieved 2017-05-27. ^ "新潟県警察ホームページ - 警察本部・警察署のご案内【県内の警察署：与板警察署】". Police.pref.niigata.jp. Retrieved 2017-05-27. Japanese 2005 census - definition of shi,ku, &c.
This page was last edited on 18 April 2019, at 13:17 (UTC).